Need New Brakes? Don’t Hesitate! Stop By Checkpoint Automotive Today! As a full-service neighborhood auto shop Checkpoint Automotive provides brake repairs for all domestic makes and models and all Asian imports. You must not delay when your brakes are underperforming as it drastically increases your risk on the road. If you no longer come to a full and complete stop with ease or in the time it used to take to stop—stop by for a brake inspection and repair ASAP! Are My Brakes Worn Out? Your brake pads protect your rotors from premature and costly wear. These pads need to be replaced every 50,000 miles or so—but this can very greatly from one driver or vehicle to the next. If you drive full time, brake hard, brake frequently, or brake fast your pads are likely to wear out sooner. We also suggest that fleets who drive heavy loads have their brakes replaced sooner. The quality of your current brakes is also an important factor. Rest assured that when you have your brakes repaired at Checkpoint Automotive that they are high quality and designed to last. All of our parts and mechanics are backed by either 24 months/24,000 miles or 35 months/36,000 miles warranty. We encourage all of our customers to stop in our shop at the first sign of anything different or new in any area of their vehicle—for any shake, rattle, squeal or change in performance. This will ensure we fix minor repairs before they escalate and minimize your vehicle downtime and overall repair expenses. Your brakes have started squealing or grinding when you press your brake pedal. If your vehicles pulls slightly, or aggressively, when you brake. If your brake pedal vibrates when you push down. If it takes longer to stop than comfortable or longer to stop than it used to. In addition to brake repairs we provide Aurora and Denver’s southeast suburbs with full service automotive repairs. 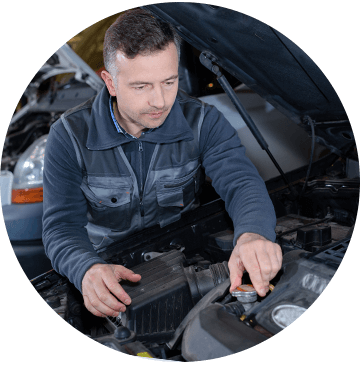 This includes Quick Lube Services to Check Engine Light Diagnostics, Leaking Fluids, Mile Maintenance Service, Precision Wheel Alignment, Transmission, Shocks and Struts, Charging and Starting Systems, Full Tire Sales, and more! While you wait you can run a quick errand to the nearby library, post office, or hair or nail salon. We also have a comfortable waiting area with Wi-Fi, coffee, water, kid’s toys and Highlights Magazine. If we need your car for the day you can arrange to use a loaner car, our free shuttle to home or work, or utilize our afterhours drop-off and pick-up. If your repair doesn’t fit in this month’s budget, we offer repair financing.